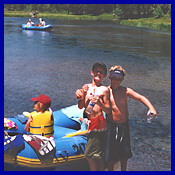 We had hardly settled into the paddling before – boing – we hit a rock and I bounced out of the raft and into the cold of the Truckee River. The kids thought it was the funniest thing in the world. So funny in fact that they couldn’t quite negotiate turning the raft or stopping so I was in for a bit of a swim. A memorable outing for sure. Rafting down the Truckee is usually a mellow affair. Mild rapids, lots of cool pools and plenty of just plain floating along Aspen and fern lined banks. On this gorgeous summer day, we showed up at Truckee River Rafting/Mountain Air Sports in Tahoe City for the float down the river. With a smooth transition from parking lot to registration to the water, I was pretty impressed. Mountain Air Sport’s riverside location, complete with rest rooms and accessory store was great for last minute necessities. We packed five kids and two adults into the eight-man raft and away we went. This end of the Truckee River runs from Lake Tahoe in Tahoe City to the River Ranch at Alpine Meadows road. The trip can take anywhere from two to four hours, depending on how fast you paddle and how long you linger at each swimming hole or inviting bank. We meandered past the “bubblegum bridge” and the “bouncing wall”, ducked under the “low bridge” and got high centered on more than our share of rocks. The baby ducks that swam along with us enthralled the girls and the boys pretended to fall off the raft (a la mom) at every opportunity. The final stretch of the route is through some “wilder” rapids. We bounced off some boulders amid the kid’s giggles. I sat lower in the raft, just in time to high center on a large rock. It wasn’t long before another raft came and bumped us back on track. Just like Disneyland! We rounded the curve to the River Ranch and were scooped to the dock, just in time to catch the bus back to the car. Fun stuff! - You can take your own raft down the river but be forewarned that there are plenty of rocks that can puncture a less than hardy craft. Then you have to contend with your own transportation back to your car. - Arrive early for the best value. Plan on spending the day. Stop often for swims or just to float along. Pack a picnic and plenty of water and sunscreen. - Life vests are provided, but if you have your own jacket be sure to pack it along, the kids will prefer a better fitting jacket to the large orange jackets provided. - Grab an oar for everyone in the boat. I didn’t think the young kids would want one – but they loved to “paddle” and splash each other. - Ditch the towels, with kids everything seems to get wet on the boat. Keep a camera in a waterproof bag. 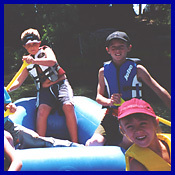 And pack some money for a treat at River Ranch where you can watch others go over the rapids. There are two concessions that offer rafting. 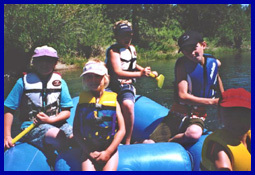 Truckee River Rafting/Mountain Air Sports (530-583-7238) is located in Tahoe City. Look for coupons or specials in the local paper. Booking via credit card in advance gets you a discount. Rates vary.